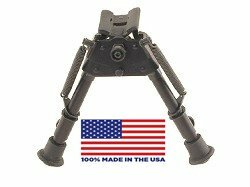 Harris Engineering Bipod Rotating Black 6-9 SBR Please note: This supplier will be closed on 11/24, 11/25, 12/26 for the holidays. The shipping cut off is UPS's cut off of 12/15 to try and have the products delivered by Christmas. Note: Please check your state regulations, hunting regulations, etc before placing an order with this supplier. Your order may be canceled if the item is not able to be shipped to your state due to their regulations. If you have any questions about this product by Harris Engineering, contact us by completing and submitting the form below. If you are looking for a specif part number, please include it with your message.